Quality craftsmanship and absolute comfort create an understated elegance in any room with electric fireplaces from Napoleon. A perfect fit into any decor, this electric fireplace is the ideal solution to quick heating for homes that may not have access to a gas line or wood burning fireplace. The Shelton electric fireplace from Napoleon boasts side doors that swing open a full 90 degrees, a burnished walnut finish, pedestal base, and comes included with the Allure 42-inch electric firebox (NEFL42FH). 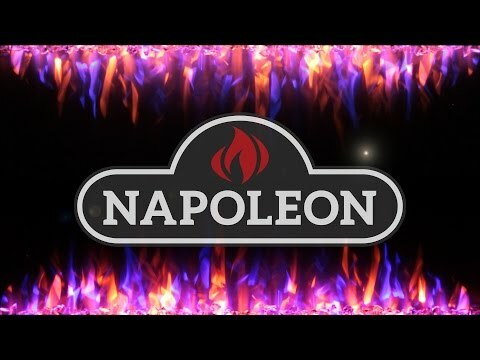 The heater pushes an impressive 5,000 BTUs and the included remote allows you to adjust the flame height and intensify the embers, adding a realistic touch to this Napoleon masterpiece. With no emissions or pollution, this energy efficient fireplace is EPA approved for overall maximum heating efficiency, which means you can achieve more heat with substantially less fuel. Napoleon delivers safety through functional products that have been both CSA and ANSI certified. 42" 50" 60" 70 1/2"